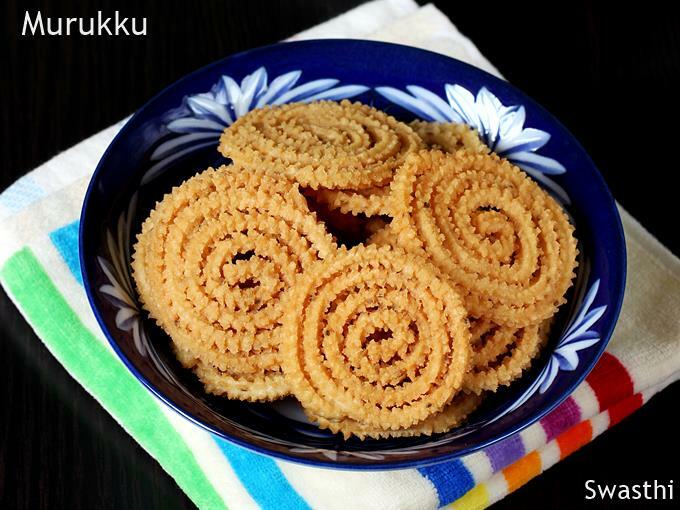 Murukku recipe – Murukulu or murukku is a deep fried Snack made with rice flour and dal flour. 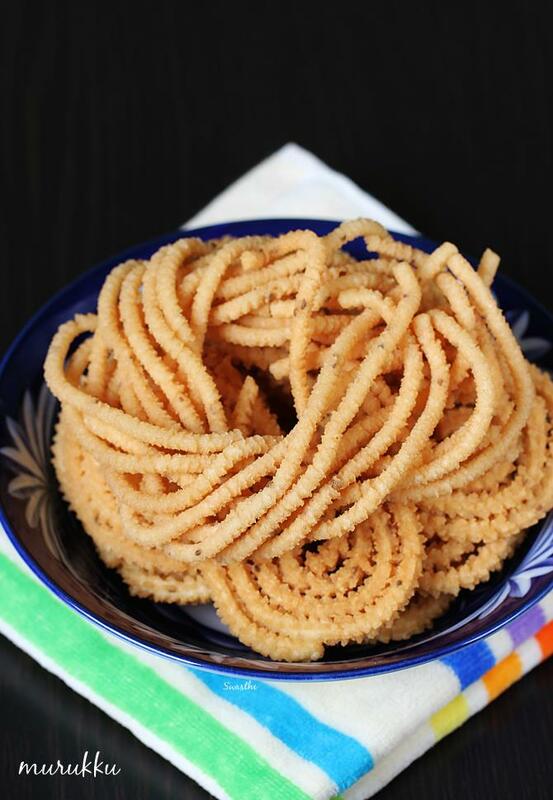 Chakli, chakuli, chakralu and jantikalu are the other Indian names to these. 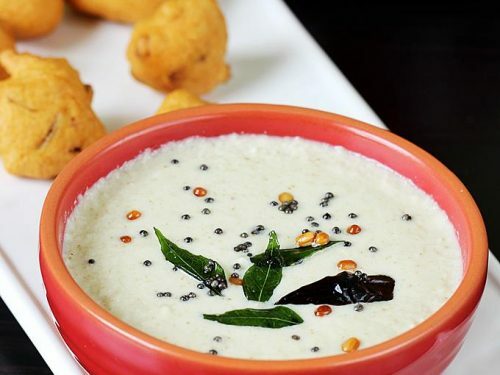 There are so many varieties of murukku, the one I am sharing here is a basic, very old and standard recipe that is followed by many South Indian women. 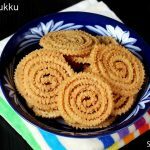 There are so many variations of making murukku using sago, besan, wheat flour, fried gram, rice batter etc, all lend a different texture and taste. This one is very different with an aroma of roasted urad flour and are crunchy as well light in texture. 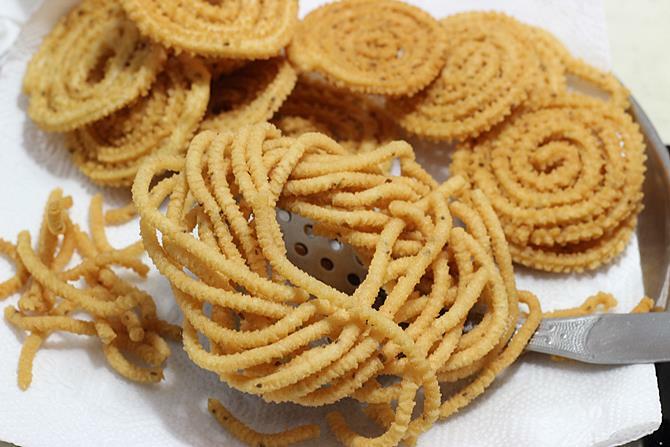 I had few requests for easy chakli (chakralu), butter murukku, ribbon murukku /ribbon pakoda, omapodi and few other snacks. I made this basic version in small quantity as my kids don’t eat these deep fried snacks much. 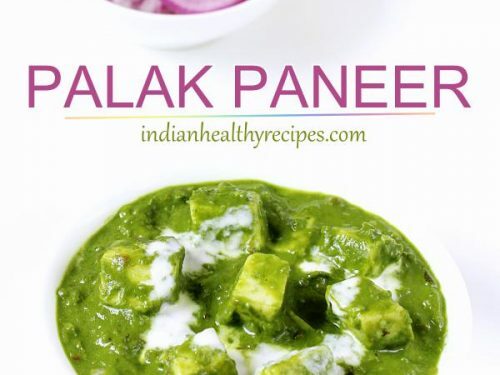 This recipe can be doubled as well and can be used to make both murukulu and jantikalu. 1. Always make a stiff dough that is not sticky. Too much moisture in the dough will make murukku absorb lot of oil. 2. 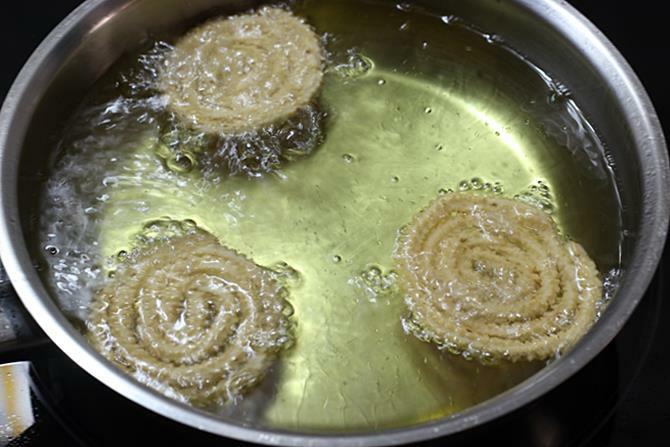 Use up the dough immediately and fry the murukku. Resting the dough will make murukku oily. 3. 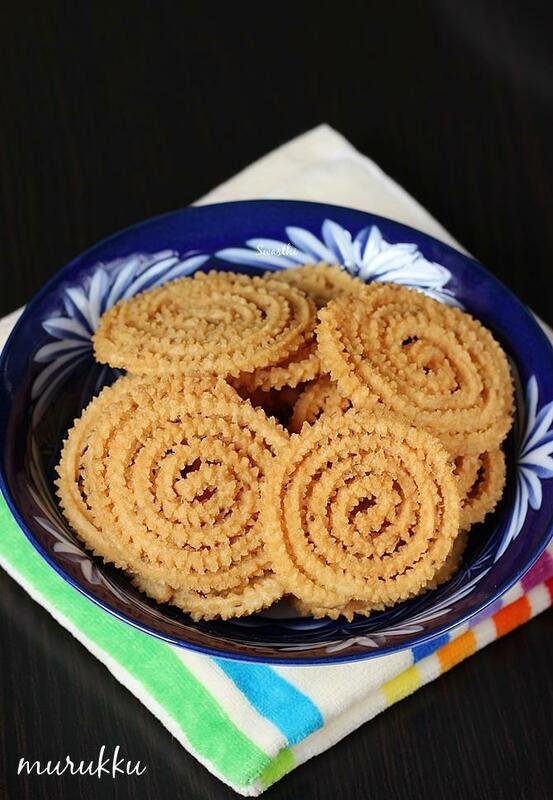 If you plan to make murukku with more then 2 cups of flour, then make the dough in batches. 4. 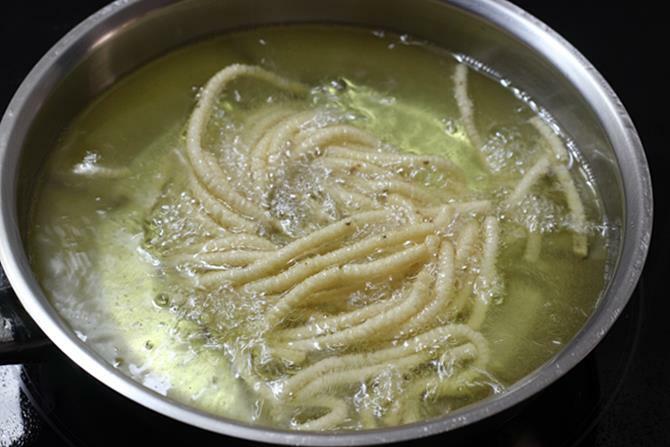 Always fry them on a medium high heat otherwise murukku will turn soft after 1 to 2 days. 5. If the oil is not hot enough then they absorb more oil and they turn soft the next day. 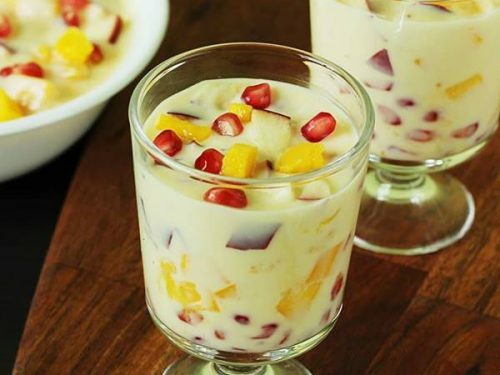 You may like to check this collection of Diwali snacks recipes and Diwali Sweets recipes. 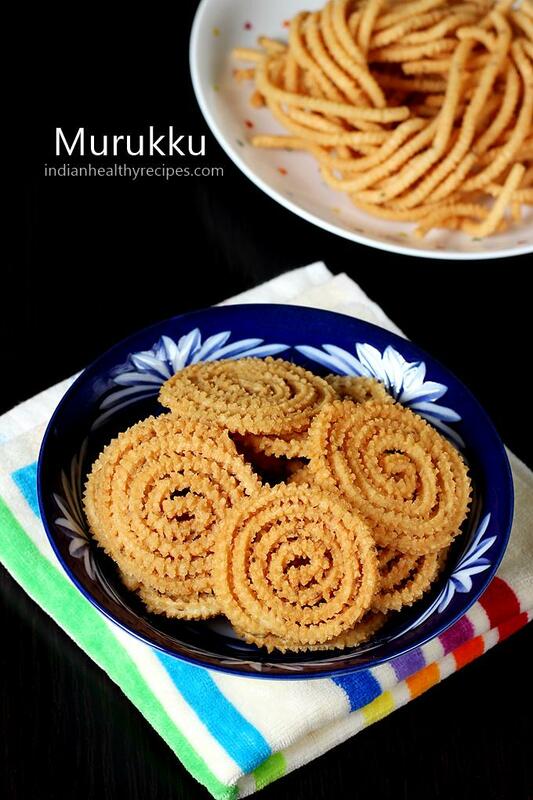 Murukulu or murukku is a south Indian deep fried snack made with rice flour and urad dal flour. These are crispy, light, aromatic and delicious. Murukku are known as murukulu, jantikalu or chakralu in Andhra. Grease the murukku mould with little oil. Also grease the star shaped plate. Dry roast urad dal on a medium heat until lightly golden. Cool and make a fine powder. If the powder is not fine then sieve it. Use only 2 to 3 tbsp flour from this. 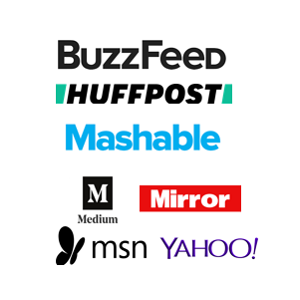 For details refer notes. 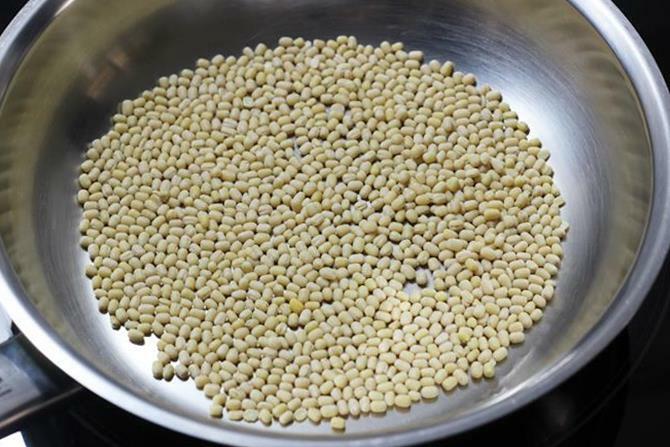 Add rice flour, urad dal flour, ajwain, salt, sesame seeds to a bowl and mix well. Next heat 1 tbsp oil in a small pan and pour it to the flour. Mix well. Pour water little by little, just enough to make a smooth dough. Do not add too much water at one time. Too much water in the dough will make the murukku absorb lot of oil. 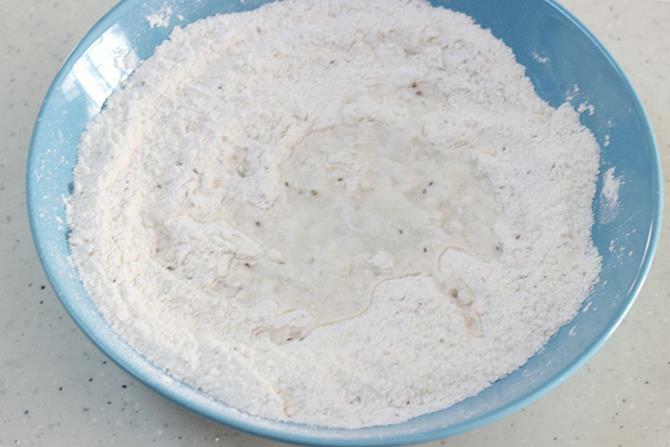 Mix the flour to dough and do not knead. The dough has to be non sticky & without crumbs. After mixing the dough it has to be used immediately do not rest it otherwise murukku will absorb lot of oil. 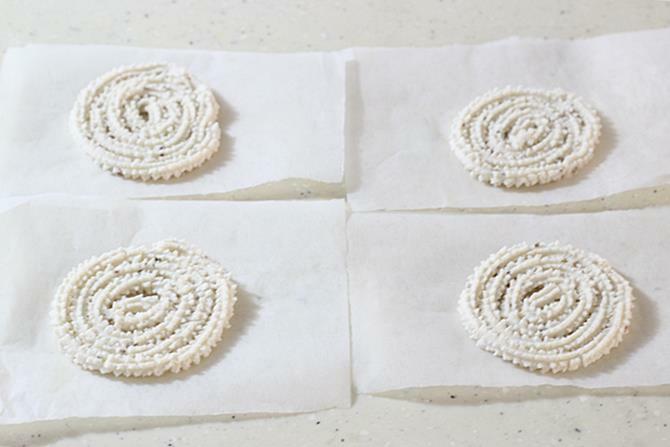 Press the mould to make spirals either on a cloth, butter paper, foil or flat holed ladle. Set the flame to medium high. Check if the oil is hot enough by dropping a small portion of the dough to the hot oil. The dough must not sink but has to rise steadily without browning. Place the laddle in the oil or remove the murukku and drop gently in the hot oil. Fry until golden and crisp on a medium high flame. If the oil is not hot enough murukku will turn soft after a day or two. Drain them on a kitchen tissue to remove excess oil. Cool them completely. Store murukku in a airtight jar. 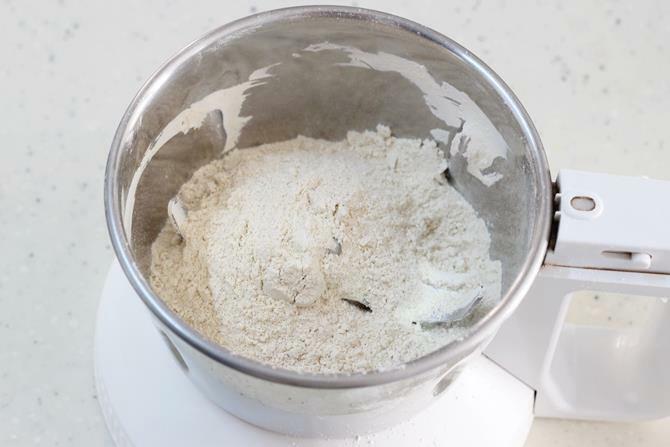 The quantity of urad flour can be increased upto 4 tbsps, They turn very aromatic and light but absorb little more oil than the ones made with 2 tbsp. flour. So you can even use 3 or 4 tbsp flour to suit your liking. They have to be fried on medium high heat. Make sure you do not fry them on a low heat. 1. 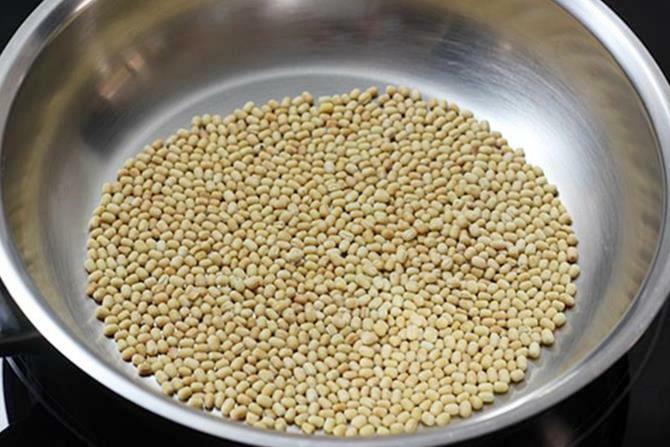 Clean and roast ¼ cup or 4 tbsp urad dal/ minapappu on a medium flame. I do not suggest skipping the roasting part as it may make murukulu chewy after a day or two. Refer the notes. 2. Keep stirring and roast evenly. When they turn lightly golden, off the heat. Do not over roast. 3. Cool and add to a blender. 4. Powder to a fine flour. If the flour is coarse and not fine, then seive it. 5. 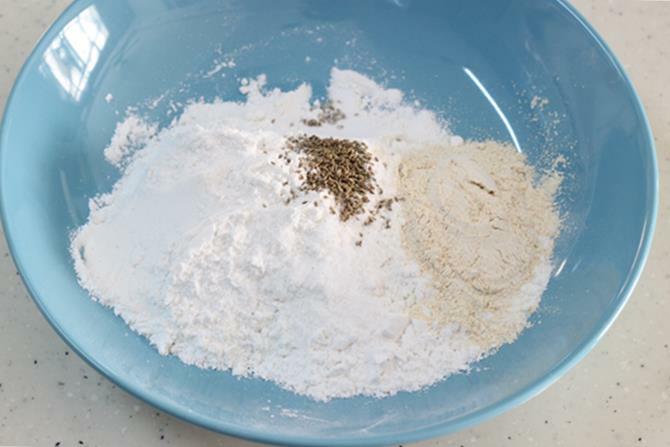 Add 1 cup rice flour, 2 to 3 tbsp uraddal flour, ajwain (omam/ vammu), chilli powder, sesame seeds and salt. I did not have sesame seeds so skipped. I also skipped red chili as my little kid cannot eat spicy foods. 6. Mix everything well. Then heat up 1 tbsp oil in a kadai and pour it. Mix everything well. Hot oil makes them light. 7. 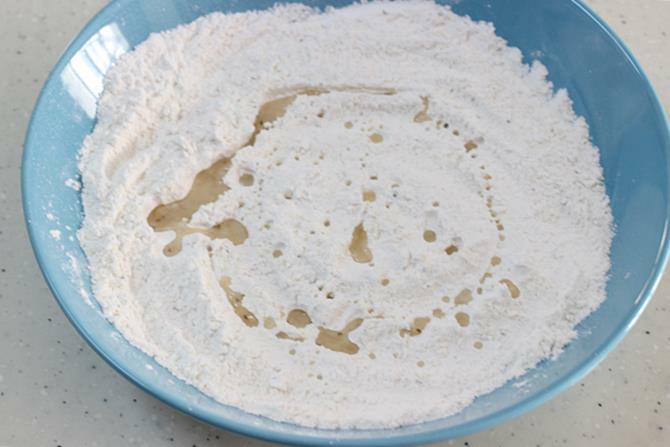 Pour water little by little and knead the flour to make smooth non sticky dough. 8. 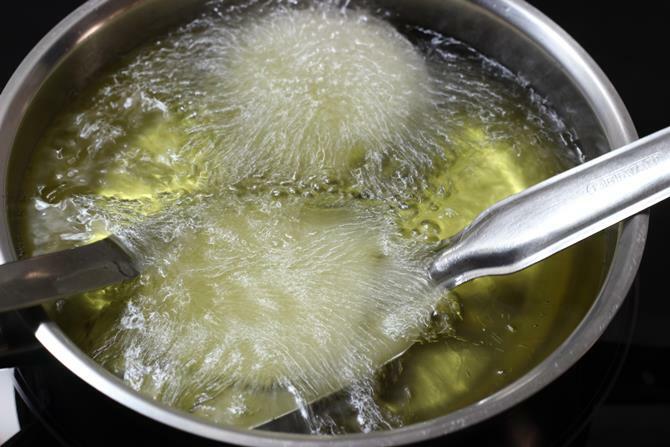 If the dough is sticky and soggy, it will absorb lot of oil while frying. If very dry then murukku / murukulu will break while making them. 9. Grease the mould, fit the star muruku plate. Stuff the dough inside. 10. 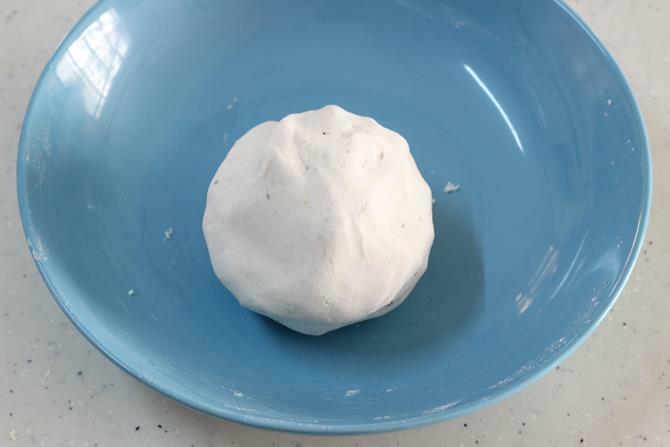 Slowly begin to press the mould to release the dough and make a spiral. A moist cloth, foil or butter papper can be used to place the murukku. I prefer to use small cuts of butter paper for convenience, as it is easy to lift each one and fry. 11. If you are a beginner, you can also make these on steel spatulas. A holed spatula works better. 12. Put on the flame to medium high. Make sure the oil is hot enough. Place them when the oil is hot enough. 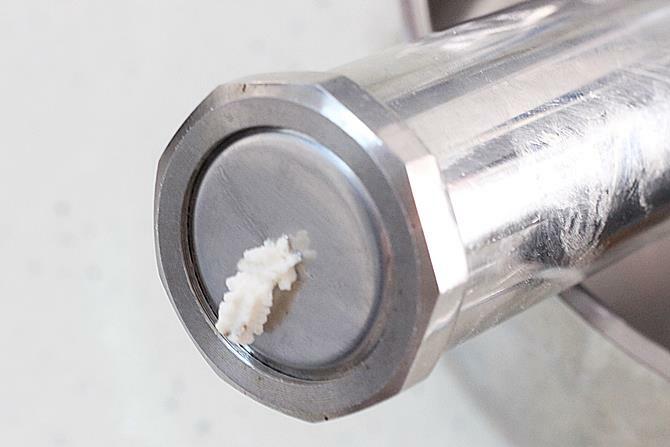 To check if the oil is hot, drop a tiny flat piece of dough in the oil, it floats if the oil is ready. The muruku will come out from the spatula when it is getting fried. 13. If made on a cloth or foil, you can lift them gently and drop in oil. Fry on a medium flame and keep stirring for even frying. Fry until golden and crisp. Bubbles begin to reduce when fried well. If not fried well, they will turn chewy after 1 to 2 days, so make sure to fry evenly on a medium flame. 14. Drain the murukku on a kitchen tissue. Store murukku in a air tight stainless steel or glass jar. 15. The same dough is used to make jantikalu. They are made with large holed sev plate or jantikalu plate. These are fairly easy and can make them directly in the hot oil. 16. Fry murukulu until golden stirring often. Drain on a kitchen tissue. Break to pieces and store in a air tight jar. 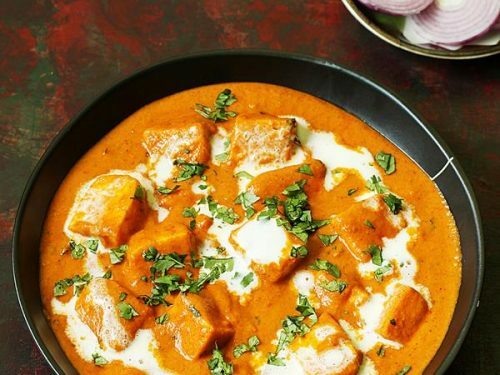 Swasthi- your recipe are always simple , practical and perfect.. have tried so many of your recipes and always give perfect results.. appreciate the wide selection of Indian foods too!! Thank you so much for trying. Glad to know the food turns out good. Any south Indian brand of rice flour should work. Some are labelled exclusively for murukku. You can try to find them. Actually making the flour at home is easy as well unless you want to make in large quantity.. Hope this helps. Hi, Tried muruku with a little doubt but it came out very well. Thanks for the crisp description and clear illustration. I feel it might be a little hard (katukulu) because of the readymade flour from the shop. 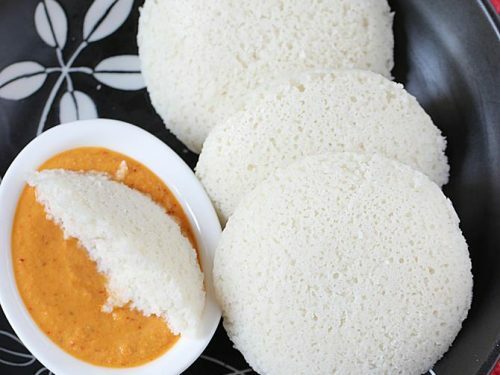 If rice flour is also washed and made at home it would be softer and easier for senior citizens. This defiinitely is a quick method and ok for children. Welcome. Yes homemade flour yields better ones. If the dough is too tight then they will turn hard. For elderly people this Butter murukku is better as they are light yet crisp and doesn’t hurt the gums & tooth. Give it a try. Thanks for trying. This recipe is great and really fast to prepare. 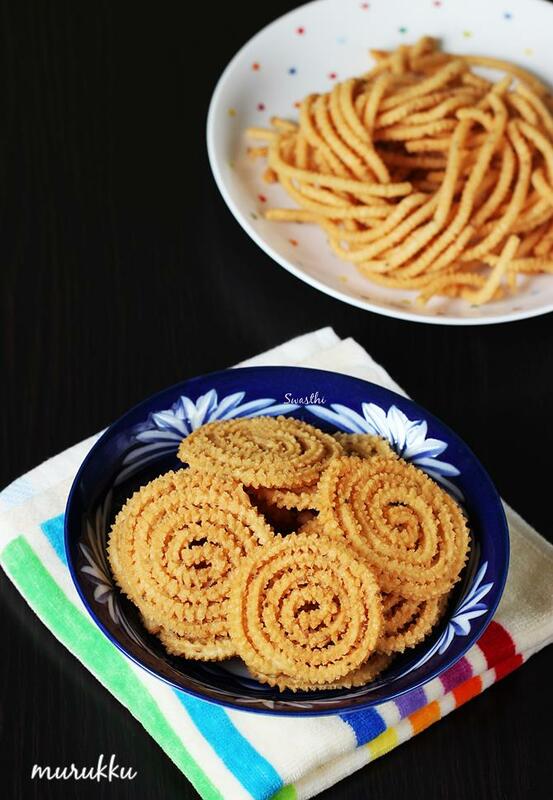 Chukri/murukku came out crispy and delicious! 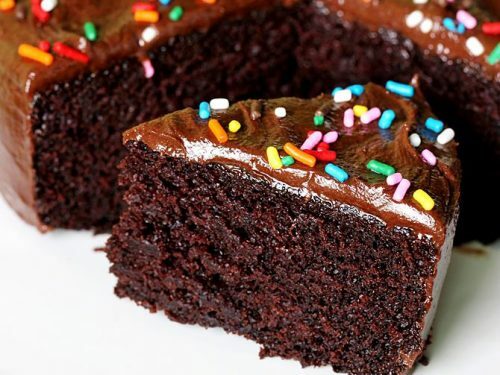 I have made these always using store bought flour. Choose one without any additives preferably a good Indian brand. It will work well. 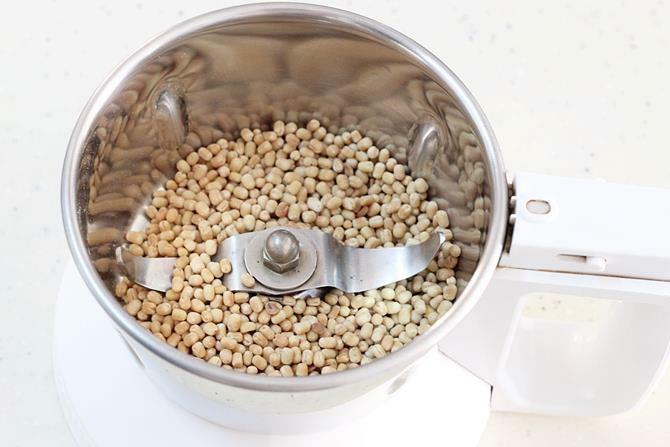 Hay thank u swasthi I will try out will try out once gain by milling the rice …. 1. Quality of rice flour. Thats the reason most ppl prefer to mill the aged rice and dal. Then use it. Low quality or starchy rice or rice flour from new harvest can also cause. 2. Frying them on low heat and for long time. 3. Wrong measurement of rice flour. 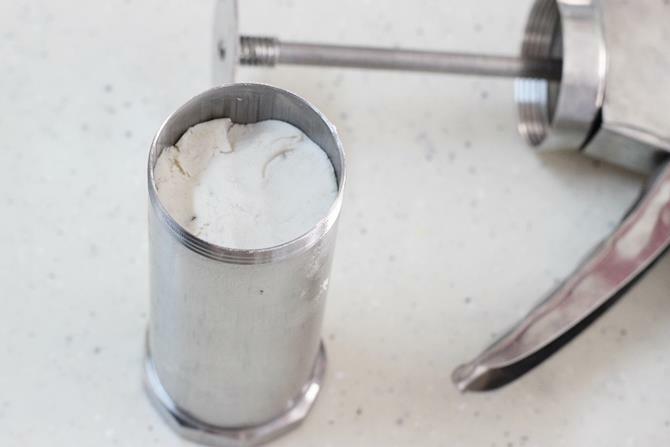 Flour has to be measured by levelling the measuring spoon. even little bit more of rice flour can make them hard. 4. Not using hot oil can make them dense and hard. 5. Dough is too tight then they can turn hard. Usually andhra jantikalu are made by milling 4 cups aged rice to 1 cup urad dal and no oil is used to mix the dough. But as I mentioned in the notes, they absorb lot of oil if made with store bought flour. That will work only if made by milling the grains. I remember when I made these even my teething kid had enjoyed them since they were not hard. 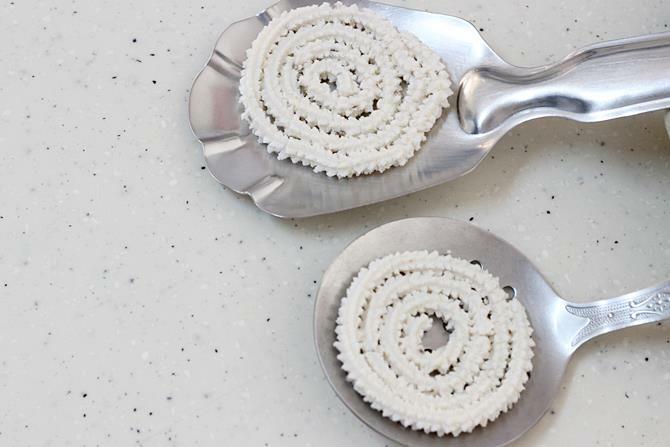 Dnt av d mould 4 making murukku..m any other alternative? Sometin I can easily use from my kitchen. Want to try these ganesh chaturthi. loved ur butter murukku. Going to double the recipe, hope it will work. 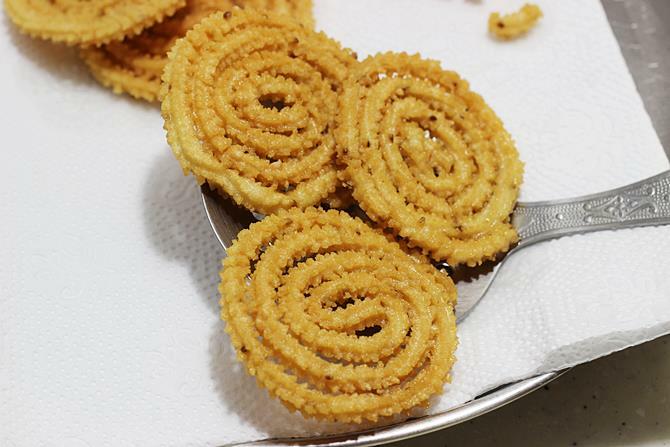 You can use this ring murukku recipe and make. But they will turn slightly hard.